Get your BMW track-ready with these RW Carbon Aluminum Tow Hooks. These tow hooks fit all BMW models. Choose between 5 vibrant colors; black, blue, purple, red, and silver. Installation is a breeze, pop out the cover on your front bumper and screw the tow hook into the port underneath. 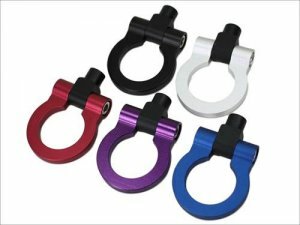 Whether you're heading to the racetrack soon or just want that race inspired appearance you need one of these aluminum tow hooks.